HOUSTON – (Realty News Report) – Battered by the downturn in energy prices that began some four years ago, Houston’s Energy Corridor seems to be on an upswing now, even though oil prices remain volatile. Still, there is a significant amount of empty office space in the sector. So, what does the future hold for the Energy Corridor? Realty News Report went directly to the source – an individual many feel is the ‘father’ of the Energy Corridor, David S. Wolff, Chairman and President of Wolff Companies. 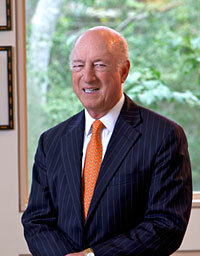 Wolff founded Wolff, Morgan and Company in 1970, which evolved into Wolff Companies in 1985 and became one of Houston’s largest developers of office, business and industrial parks. During his five decades in Houston, Wolff has worked on many community endeavors including the West Houston Association — which he co-founded and chaired for six years — and the Houston Parks Board, (12 years, including two terms as Chairman). He served as Chairman of METRO (the Metropolitan Transit Authority of Harris County) from 2004 to 2010 during which time the Authority earned $900 million of Federal funding and commenced construction of three new light rail lines. Wolff also speaks out on what may be the worst transportation decision ever made by Houston leaders. Realty News Report: Can you tell us about the beginnings of the Energy Corridor? David S. Wolff: A number of factors contributed to the Energy Corridor including Houston’s traditional westward growth, Katy Freeway access, the availability of large tracts of land both inside and west of Highway 6 – the closer-in tracts for corporate campuses, the land west of the reservoirs for large residential developers to form MUD’s and do master planned communities – and the decision-making executives residing in the adjacent Memorial area. Some said Addicks and Barker Reservoirs would stop growth into the area, but we felt development would leapfrog the Reservoirs, and that they would ultimately be a major benefit, providing 26,000 acres of open park space in an area that would become densely populated. Realty News Report: Did you create the “Energy Corridor” name? A lot of people credit you for that. If not, do you know who did? David S. Wolff: It’s quite possible that I did, but I don’t specifically recall that. Realty News Report: Wolff Companies’ Park Ten business park was a major play. How did that development unfold? David S. Wolff: We went out there because we felt there was an opportunity to develop a light industrial park along the Katy Freeway. Starting in 1972, my then partner – Niel Morgan – and i were able to assemble 15 contiguous properties totaling 550 acres with 2.6 miles of freeway frontage extending all the way from Highway 6 west to Barker-Cypress Road. This became Park 10. It, in essence, was the connection between the land east of the reservoirs and the land to the west. The land was separated from the freeway by a railroad track. We obtained agreement from Reginald Whitman, MKT Railroad’s Chairman, not to erect billboards on their right-of-way, landscaped between the rail and the freeway and built Park Row to connect from Highway 6 to Barker Cypress so as to provide access without crossing the tracks. Today the tracks are gone. We were attracted by the difference in prices inside Hwy 6 and outside Hwy 6 — $38,000 per acre inside versus $10,000 per acre west of 6. We saw a lot of marginal, earlier development closer-in on Katy Freeway, (which at one time was Katy Road), and felt there would be a demand for larger, higher quality uses as development moved west into the new, unspoiled area. Our initial selling prices were under $1 a square foot – users such as M. W. Kellogg’s Research Center acquired sites in Park 10 and prices soon increased to $1.50 and $2 for service center/flex buildings. Then, more companies such as Star Furniture and Atwood Oceanics came in. Subsequently we were able to attract office users such as PROCON and Morrison-Knudsen. Eventually prices moved up into the $10 per square foot range with high end purchasers such as the Houston Chronicle as well as suburban office building developers. Now land prices in Park 10 exceed $20 per square foot. In the early ‘90s, during the real estate downturn, we were able to re-acquire a lot of the land in Park 10 from banks and the Resolution Trust Corporation. We continued to believe in the location as well as the quality of the infrastructure we had built and put cash back into these properties. We successfully revived Park 10 and, as the market returned, resold that land between 2000 and 2010. During that time, working with Stan Creech, we expanded Park 10 to the south by buying 30 acres across the Freeway, which became the location of five hotels, as well as 83 acres to the west at the northwest corner of I-10 and Barker Cypress. That land is now the Texas Medical Center’s West Campus where Texas Children’s Hospital and Methodist Hospital are located, representing investments in excess of $500 million. Realty News Report: What really made the Energy Corridor take off? David S. Wolff: At the beginning, as we were assembling Park 10, Shell acquired 200 acres extending from Dairy Ashford to Eldridge, later selling the western half of that to Conoco. Exxon Chemical and ARCO soon built their campuses then Amoco (now BP) developed their towers. The major oil companies attracted smaller oil companies, engineering firms such as Stone and Webster and Worley-Parsons, drilling companies such as Diamond M and oilfield service providers such as Schlumberger and McDermott as the Corridor became a respected and proven location. Many of the locational decisions were made by executives who lived in Memorial. Quite important were the very active large scale residential developments taking place on literally thousands of acres west of the Corridor — Cinco Ranch. Kelliwood, Williamsburg etc. — and the increasing desirability of the Katy and Cypress-Fairbanks school districts as they developed. Families were able to buy a new house for $200,000-$300,000 in an attractive master planned community and a good school district — and be 15 minutes from great employment! The new housing attracted the employers because they knew it would help them attract and retain good employees; and the jobs brought the buyers. Great synergism with each feeding the other. Realty News Report: A lot of office space was built from 2010 to 2015. Then oil prices crashed. Some of that new space has never been occupied and energy firms have been slow to expand. Vacancy is high and sublease space is prevalent. It was quite a fall from being the hottest submarket in the nation in 2013. How can the Energy Corridor office market recover? David S. Wolff: I think it is definitely recovering. The factors that made it attractive during the initial phases are those that prevail today. Conoco is moving from its present campus at the northeast corner of I-10 and Eldridge to two new towers developed by Trammell Crow totaling about 1 million square feet at the southwest corner of that intersection. Occidental, in turn, is relocating from 800,000 square feet in Greenway Plaza to acquire Conoco’s former campus. Transocean is also coming from Greenway to fully occupy a new 300,000 square foot building on Eldridge. There is a strong rumor that Marathon will be moving from the Uptown area to a new 600,000 square foot tower at I-10 and the Sam Houston Tollway. Schlumberger continues to expand, and BP has leased new space. Saudi Aramco has a new research center in Park 10. Air Liquide has moved from Uptown to 597,000 square feet in Memorial City. It’s really a continuation of the factors that made the Energy Corridor in the first place, i.e. the freeway infrastructure, high quality job formation, and large master planned residential communities in attractive school districts. Now construction of the Grand Parkway has not only made the area even more accessible but has stimulated new, quality residential development such as Cross Creek, Elyson by Newland (Cinco Ranch) — and Bridgeland by Howard Hughes (The Woodlands). New housing is happening on these 20,000 acres and more companies are now moving out there for the same reasons – job formation coupled with great affordable residential opportunities with easy commutes. Realty News Report: Exxon Chemical vacated and sold its 37-acre campus in 2014. BP is moving a major division to Denver. Some promoters in North Houston have been calling that area the “New Energy Corridor.” Is there a chance that years from now, that the Energy Corridor could lose the critical mass in the energy sector so that it doesn’t deserve the name anymore? David S. Wolff: Actually, it’s adding to the critical mass at this time and it is diversifying. I mentioned Occidental, Marathon, Transocean, Saudi Aramco, Schlumberger and Air Liquide. In addition, there are important non-energy companies such as Sysco and Toyota with major headquarters in the area. And now the largest aggregation of healthcare facilities outside the Texas Medical Center. MD Anderson is completing its new $200 million development in our Central Park which will open in the next 90 days to join Methodist and Texas Children’s. So, the Energy Corridor is diversifying with more energy companies joined by healthcare and non-energy companies. Whether in the future it is called the Energy Corridor or the “Downtown of West Houston” ( a community of more than 1 million people) is not important. The attraction is still the same: accessibility, job formation, desirable new housing and attractive school districts. Realty News Report: Hurricane Harvey and the subsequent U.S. Corps of Engineers’ relentless releases from Addicks and Barker reservoirs kept some properties under water for more than a week after the storm passed. How can the Energy Corridor recover from this? David S. Wolff: While it has recovered. this issue cannot be ignored. Companies have to be very informed as to elevation and drainage on a site-by-site basis and design new facilities with an eye to future conditions — for example, not building underground parking. Of course, we in Houston have a lot of work to do to improve our infrastructure with regards to handling future flood conditions and the West Houston Association is a leader in that effort. It’s the story of Houston –adapting as we go along. Realty News Report: Mobility is a growing concern as Houston continues to grow. At one time, there was a railroad line on the north side of the Katy Freeway (Interstate 10) that could have provided right-of-way for a commuter rail, but decision was made to widen the freeway, instead of putting in rail. Was that a wise decision? David S. Wolff: I do not believe it was. Rail could easily have been incorporated in the rebuilding of the freeway, but this was blocked by some short-sighted politicians. Nevertheless, the widening of I-10 to 24 lanes (it is now one of the largest freeways in the country) coupled with the completion of Park Row as a freeway-parallel major thoroughfare from Dairy Ashford 11 miles west to the town of Katy have been great for mobility. Realty News Report: What does Houston’s future look like? David S. Wolff: I have been developing in Houston for more than 50 years – I came here when the population was 1.2 million, now it is 7 million — and I tell people that Houston can be a difficult city to predict. But the strength of our city is based on it being an open society which is growth oriented and optimistic. As long as these factors continue, I share in that optimism.